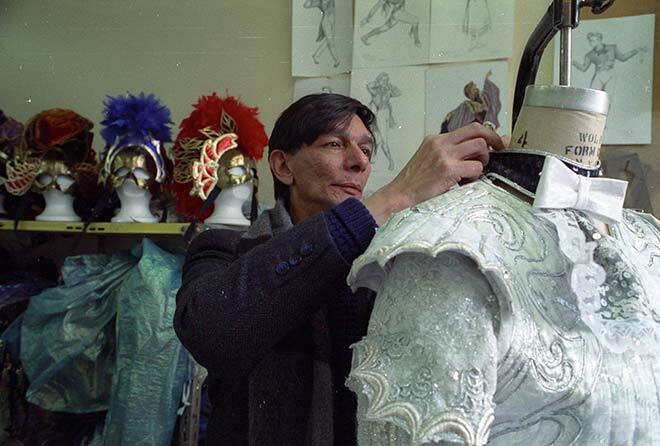 Costumier Kristian Fredrikson is shown in 1990 checking a Royal New Zealand Ballet Company costume. The garment is typical of Fredrikson's work: sumptuous, jewelled and beautiful, while allowing the wearer complete freedom of movement. Fredrikson, a New Zealander, worked internationally, designing for ballet, opera and theatre companies. Ballet is sometimes referred to as a ‘theatre art’ because it includes not only dance, but visual and musical elements. Set and costume design – the visual element – has been a strong part of New Zealanders’ response to ballet. For many decades ‘white ballets' – Giselle and Swan Lake, for example – were the most popular. In these, female dancers wear white romantic (mid-calf length) or classical (short or pancake) tutus.